Trainer Chad Summers was visibly more relaxed Sunday morning at Churchill Downs following Mind Your Biscuits’ comfortable 4 ¾-length victory over Toast of New York in Saturday’s $200,000 Lukas Classic Presented by Budweiser (Grade III) but the 33-year-old conditioner has a major decision that is still pending: which Breeders’ Cup race will his brilliant 5-year-old enter? The son of Posse covered the Lukas Classic’s 1 1/8-mile distance in 1:48.64, which was just six-hundredths of a second behind Fort Larned’s 2013 stakes record of 1:48.58. Tyler Gaffalione rode the winner for Summers, who co-owns the horse with Shadai Farm, J Stables LLC, Head of Plains Partners LLC, M. Scott Summers, Daniel Summers and Michael Kisber. The Breeders’ Cup will be held on Nov. 2-3 beneath the historic Twin Spires of Churchill Downs for a ninth time. Mind Your Biscuits will remain stabled in Barn 18 at Churchill Downs through at least the Breeders’ Cup, according to Summers. Toast of New York, who competed for just the third time in nearly four years in Saturday’s Lukas Classic, is also slated to remain at Churchill Downs, according to trainer Jamie Osborne. The 7-year-old gelding’s Breeders’ Cup plans are still in flux, according to Osborne. For more information about the Breeders’ Cup including possible contenders and ticket information, visit: www.breederscup.com. STEWART ‘PUMPED AS EVER’ FOLLOWING SEEKING THE SOUL’S ACK ACK VICTORY – The smile on trainer Dallas Stewart’s face was hard to miss Sunday morning at Churchill Downs following Seeking the Soul’s gutsy 1 ¼-length victory in the $100,000 Ack Ack Presented by GE Appliances (Grade III) Saturday night. Now, the six-time winner is likely headed to the Breeders’ Cup, according to Stewart. 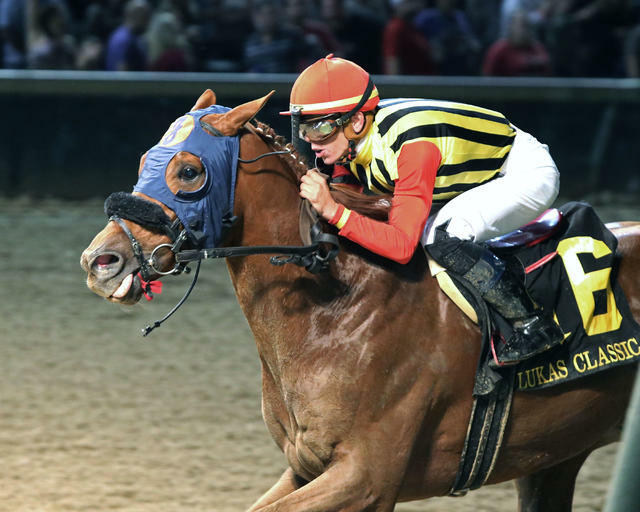 LANERIE CLINCHES SEPTEMBER MEET JOCKEY TITLE; TRAINER, OWNER RACE TO BE DECIDED SUNDAY – Following Saturday’s 11-race program, perennial leading rider Corey Lanerie clinched his 16th title at Churchill Downs. He entered closing day Sunday with a 15-12 lead over Julien Leparoux but the latter only had one mount. The leading trainer and owner titles, however, will be decided with Sunday’s 10-race program. Trainer Tom Amoss had a 7-5 win lead over Steve Asmussen, Brad Cox and Ian Wilkes to begin Sunday’s card. Wilkes has been mathematically eliminated with only one starter in Race 8. -Cox entries: Marquee Prince (Race 3, 7-2); Julius (Race 4, 7-5) and Lodestar (Race 6, 7-2). There are 12 different owners with the possibility to win the September Meet title. Calumet Farm, G. Watts Humphrey Jr., Lothenbach Stables, Maggi Moss, WinStar Farm, China Horse Club and SF Racing and Whitham Thoroughbreds are tied atop the leaderboard with two victories. Calumet Farm was the only owner with an entry Sunday: High Sheriff (Race 8, 15-1). Jackie Rojas and Gary Tussey began Sunday with one victory but are not mathematically eliminated from the title. Naveed Chowhan and Phillip Jones did not have any victories at the September Meet but had two entries a piece Sunday. $19,973 CARRYOVER FOR SINGLE 6 JACKPOT; MANDATORY PAYOUT CLOSING DAY – Racing at Churchill Downs resumes Sunday for closing day of the 11-day September Meet. The first of 10 races is 12:45 p.m. Eastern and there’s a $19,973 carryover in the Single 6 Jackpot, which has a mandatory payout because of the meet’s conclusion. The six-race sequence will cover Races 5-10 starting at 2:45 p.m.
DOWN THE STRETCH – Prior to Sunday’s closing day, there have been 56 claims for a total of $1.17 million. … Racing will return to Churchill Downs on Sunday, Oct. 28 for the 21-day Fall Meet headlined by the Breeders’ Cup World Championships on Nov. 2 and 3.